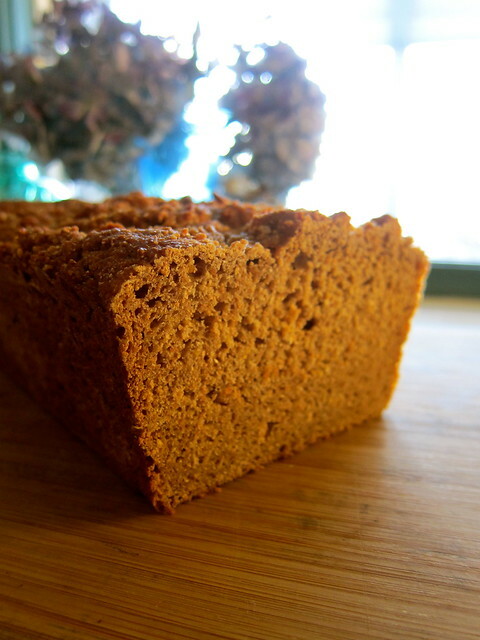 Essentially a quick version of brown bread, this hearty loaf is a beautiful expression of local ingredients, and has become one of our favorite ways to use the grainy whole wheat flour and nutty cornmeal being produced around us. We’ve gotten in the habit of substituting boiled cider for when molasses is called for, particularly in baking, which adds its own fruity fragrance and mineral notes. This traditional New England syrup is made by evaporating fresh apple cider, and we either make our own or pick up a ready-made supply when our travels take us to Vermont; both Wood’s Cider Mill and Champlain Orchards will ship. We like thick planks of this bread toasted for breakfast, either on it’s own or paired with cheddar. As of late, we’re indulgently slathering it with the rich, buttery crema from a recent visit to Wolf Meadow Farm. – Heat oven to 325°F. Grease an 8×4-inch or 9×5-inch loaf pan. Sift together the whole wheat flour, cornmeal, sea salt and baking soda; this will remove any coarse bits from local flour, and ensure the baking soda is evenly distributed. Mix the buttermilk and boiled cider together, then stir it into the dry ingredients, just enough to combine. Immediately pour the thick batter into the greased loaf pan, and quickly smooth out the top as best you can. Place in the oven and bake until firm, about an hour. A toothpick inserted into the center should come out clean. Cool on a rack for 15 minutes before removing from the pan. — Adapted from “How to Cook Everything” by Mark Bittman, via Food52. Local ingredients: Whole wheat flour from Maine Grains; flint cornmeal from Songbird Farm; boiled cider from Wood’s Cider Mill; sea salt from Maine Sea Salt; butter from Casco Bay Butter; and homemade buttermilk from Harris Farm milk. This entry was posted in cooking and tagged baking, boiled cider, buttermilk, cornmeal, daily bread, local flour. Bookmark the permalink. It makes a great snacking cake, perfect for afternoon tea! The cider molasses can be boiling water processed and canned like any syrup, and have a 1+ year pantry life (the fruit flavors deteriorate with age, but will still be edible). excellent – thanks for the tip! will keep an eye out for a good price on cider this fall. Very impressive use of locally sourced ingredients, and a delicious sounding bread. Really amazing the range we now have locally — three of these ingredients weren’t even available a few years ago.